Queer spoken word poetry duo DarkMatter came to Isla Vista for an afternoon of eccentric poetry, quirky banter, and political pizzazz on May 9, 2015, organized by University of California, Santa Barbara’s Queer Commission. ​DarkMatter is made up of trans South Asian performers, Alok Vaid-Menon and Janani Balasubramanian, based in New York City. DarkMatter regularly performs at venues such as La MaMa Experimental Theater, Nuyorican Poets Café, and the Asian American Writer’s Workshop. DarkMatter has also recently participated in the Public Theater’s Under the Radar Festival and the Queer International Arts Festival. Vaid-Menon and Balasubramanian met for the first time in 2009 at an organizing meeting in college, where they bonded over writing poetry. Their work seeks to overcome an unspoken rejection, from queer communities to racial minorities to an inherent conservatism in South Asian communities—both of which erase the existence of people like Vaid-Menon and Balasubramanian. ​The name DarkMatter eloquently describes Vaid-Menon and Balasubramanian’s goals in scientific terms. ​DarkMatter’s #ItGetsBitter tour highlights how contemporary LGBT perpetuates racism and imperialism, as well as the importance of student and youth activism. According to the two poets, the rise in racist and queerphobic violence denotes an imperialist agenda at home and abroad. As a result, LGBT rights have become co-opted in order to advance this imperialist agenda. 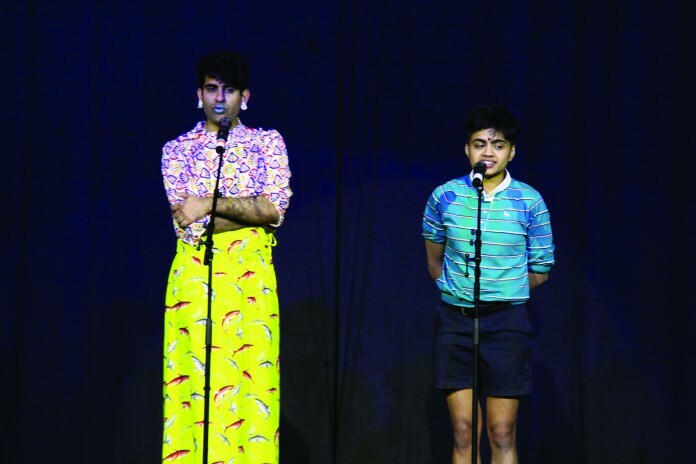 ​On Saturday, the duo performed a series of spoken-word poems that focus on the South Asian diaspora, the queer community, and the gray area where the two overlap. After the event, Vaid-Menon and Subramanian answered questions from the audience about DarkMatter’s origins, youth activism, and the subject matter of their poetry. According to Vaid-Menon and Subramanian, the South Asian diaspora is much more conservative than South Asia itself, as a large portion of the diaspora consists of Hindu, upper-caste Indians, where people in the queer community are encouraged to hide their identities. ​A small collection of DarkMatter’s poetry was sold after the event, including many of the poems Vaid-Menon and Balasubramanian performed during the show. For more information on the queer performance artists, visit darkmatterpoetry.com.